Let us brighten your day too! 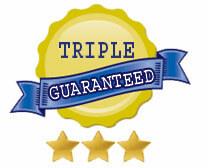 Your Residential Window Cleaning Is Guaranteed 3 Ways! We don’t control the weather but we guarantee that you will not have spots on your glass for at least 48-hours after your cleaning. If you see spots, we’ll be glad to come back and remove them. Just give us a call. It’s easy to say “Satisfaction Guaranteed”, but for us it’s personal. 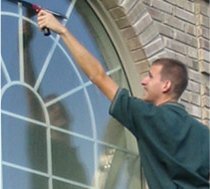 We know that the ONLY reason for our continued success is YOUR trust in us to deliver window cleaning perfection, our reputation and our entire business depend on keeping your trust. We’re not satisfied with our work until you are. We’re really picky. We hate streaks and spots on windows, so we only use scratch-free, streak-free methods that remove 100% of the dirt. We promise, if you see streaks after we leave, just call and we will return to touch it up. 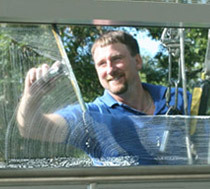 What Can You Expect When our Residential Window Cleaning Technician Arrives at your Home? We start by arriving on time. Next, we take care to protect your home’s surfaces – such as interior flooring, floor coverings and furniture, as well as the exterior landscaping, flowers and your home’s siding. 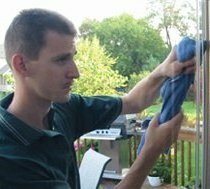 Then, we gently wash your glass surfaces – thoroughly removing dirt, spots, fingerprints, smudges, grease, and film – then squeegee them to a spot-free shine. This scratch-free, streak-free method removes 100% of the dirt, and leaves nothing behind but a clean, fresh scent. And if it rains within 48 hours of our visit, we guarantee your windows will remain spotless or we’ll come back and touch them up at no charge. Have you ever hesitated to have workers in your home? “I felt very comfortable having him in my home. “Kyle was a nice, friendly person. Today, Great Lakes Window Cleaning is a local, family-owned business, not a franchise – franchises tend to have great looking marketing materials from the national franchise; whereas our marketing materials, website and photos are of people who are our employees right here in Michigan; the same people that will come to your home and we are dedicated to our local customers and their satisfaction right here in Central & Mid Michigan for over 30 years. 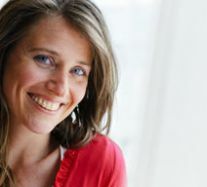 To ensure you are both pleased and feel secure every cleaning technician goes through a challenging hiring process that begins with an extensive background check. Then, they must meet our stringent standards for ethics, courteous behavior and outstanding customer service. Only after they’ve met those requirements do they undertake our rigorous 13-week training course that includes 500 pages of written training, much on the special demands of working respectfully and discerningly in a private home plus a two year hands on apprentice program. Serving Mid-Michigan, Ann Arbor, Chelsea, Grass Lake, Michigan Center, StockBridge, Howell, Brighton, Gregory, Ypsilanti, Waterloo Township, Pittsfield, Milford, Wixom, Novi, Lima Center Dexter, and surrounding Central / Mid - Michigan Areas, including Jackson, Washtenaw & Livingston Counties.